I always say that I don’t need a scale to tell me my pants are too tight. Similarly, I can always tell when I’m up or down based on how my rings fit. Now my wedding rings are magical – they always fit no matter how up or down I am. I’m serious. They fit today and they fit when I was 50 pounds heavier. Of course, they are much more comfortable to wear today! But I’m talking about other rings I have, and specifically one that was my grandmothers. I love everything about this ring. I love that it belonged to my grandmother, who I am named after but never knew. I love that my mom trusted me with it. I love the design. But if I’m carrying any retention or am even one pound up from my current weight, it’s too tight. I don’t weight in until tomorrow but I have done great this week. A little exercise but lots of movement, and I’ve tracked every day, drank lots of water and tried to watch the sodium. So you know what that means . 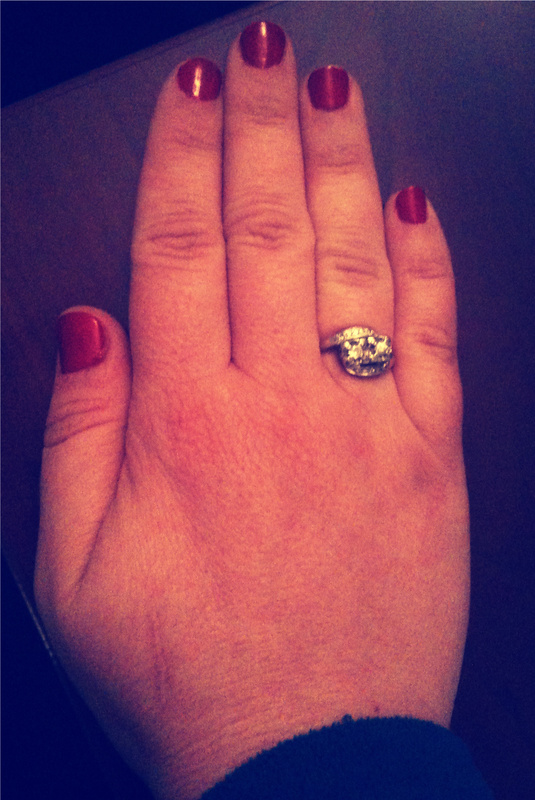 . .
… hello grandma’s ring! It’s almost as good as being able to button my if-these-are-too-tight-you-need-get-it-together jeans! Previous PostFood Log – 4/24/12Next PostEasier Said Than Done? Awesome! That is a great accomplishment and has to feel real good. I need to get all my rings sized.